We're learning about chemistry in my science class and we were going over what different elements can be used for. We got to nitrogen and said that it's used in fertilizer and can be an explosive if mixed with the right stuff and the teacher mentioned that ammonium nitrate was used in the Oklahoma City bombing. All the kids in class looked at him and several said "Oklahoma City was bombed?" He turned to me and gave me a look signifying that we were old. "Yeah, it was what? 1995? Didn't 100 people die in it?" I replied, "Closer to 150, I think. A lot were children." The point is, this was a class for high school sophomores. These kids were born in 1999 or 2000 so their world doesn't contain the Oklahoma City bombing and it barely contains 9/11. I was only 12 when it happened (my birthday was one week before) but it really made more of an impact on my life. Much more than 9/11 ever had on me. The main reason being, 9/11 was a strictly big city attack. An attack like 9/11 would only happen in a big city--a major big city, while something like the Oklahoma City bombing can be anywhere. 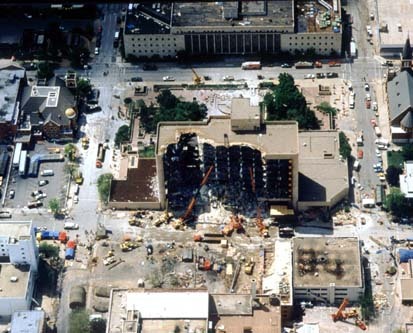 Timothy McVeigh bought all of the stuff he used in the bombing in Kansas. What if he had chosen the Frank Carlson Federal Building in Topeka instead of the Alfred Murrah Federal Building? When on a trip to Houston in 2001, my mom and I stopped in Oklahoma City specifically to see the memorial among a couple other things but that's all a long story. It was so powerful walking into it and seeing the chairs representing the 168 men, women and children who died. Visiting that memorial has always stuck with me. I was 18 at the time, about to become a father, and about a month later, 9/11 would happen. "Murrah Building - Aerial" by US Army Corps of Engineers - Hronek, Sheri (August 2001). Why would you have to request the box be marked "Fragile?" The person shipping the thing should automatically write "Fragile" on the box of highly fragile dishes or package them better so they don't knock together. Instead of wondering why the deliveryman would do that, it's time to call the company who delivered it and ask them to pay to replace the dishes and why they are delivering on a Sunday.